Despite having dry skin that you would think would need quite a rich moisturiser I tend to find that my skin really likes gel creme type formulas, with my current favourites being Clinique's Moisture Surge or Origins' GinZing moisturiser. Along with many of their recent new releases when I saw The Body Shop were bringing out a new sorbet moisturiser I couldn't wait to get my hands on it. Unlike The Body Shop's other moisturisers which come in either plastic pots or squeezey tubes this comes in a frosted glass pot that looks very attractive but is obviously a little on the heavier side than their other packaging. The sorbet itself certainly has a very unusual texture that some people may not be so keen on. 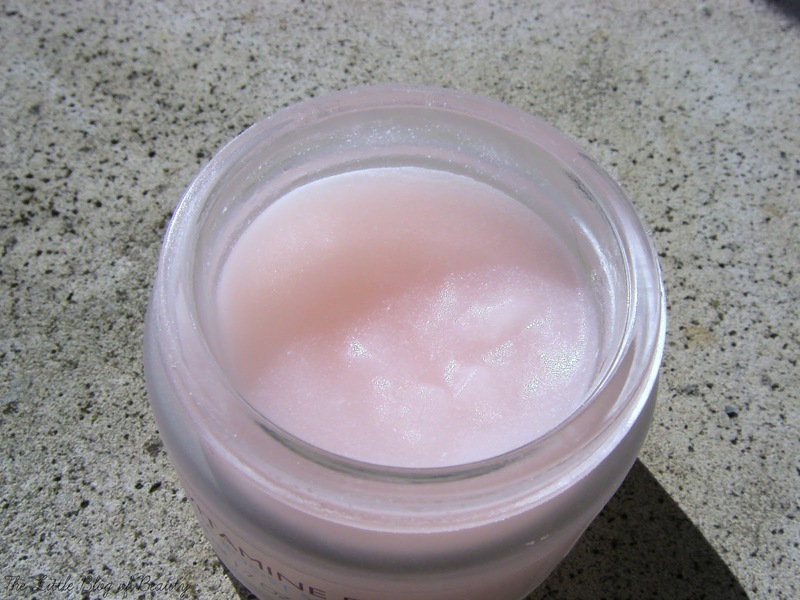 This is a light pink coloured gel that when applied to the skin feels very smooth but also kind of bitty. I think the reason for this is that it contains millions of tiny aqua spheres, which I assume are the little white specks you can see in the gel, that hold many times their weight in water. These aren't left sitting on your skin though, I assume they 'burst' as you massage this in to release all the moisture that they're holding. This is the perfect type of morning moisturiser for hot humid weather as it's very cooling and refreshing to apply and apart from the slight bitty texture it feels just like you're applying water to your skin. It absorbs very quickly, I'd even go as far as saying it absorbs instantly, and leaves a matte finish so it provides a great base for makeup. Recently I've been using this if I have to get up really early for a shoot as it absorbs so quickly I can apply my makeup over the top straight away so I can have an extra few minutes in bed (every minute counts when you're getting up at 3am!). This is for all skin types but even though it's packed with moisture if your skin is very dry and usually likes a rich cream this may not quite be right for you, it all depends on what your skin likes. I have noticed that when my skin has been particularly dry, although this hasn't quite managed to banish some flaky patches when first applied these have gradually improved through the day and are much less flaky, if not flake-less by the time I've removed my makeup. 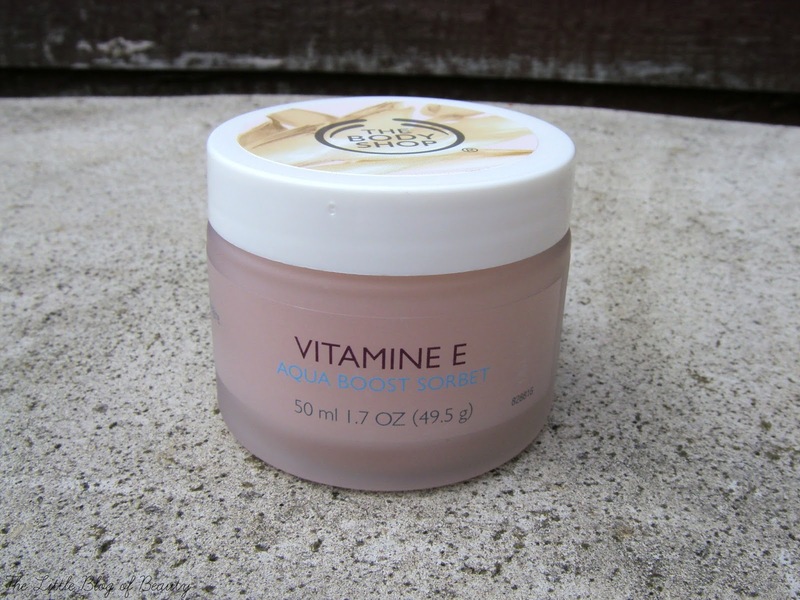 The Vitamin E Aqua Boost sorbet is £12 and is available online and in The Body Shop stores. You can currently get 30% off if you buy three products and 40% off if you buy five, so if there's a few products you're after you could get this for either £7.20 or £8.40, which I think it a bit of a bargain. Would you try the Vitamin E Aqua Boost sorbet?